Are you wondering where to start with your vanity number search? We can help. 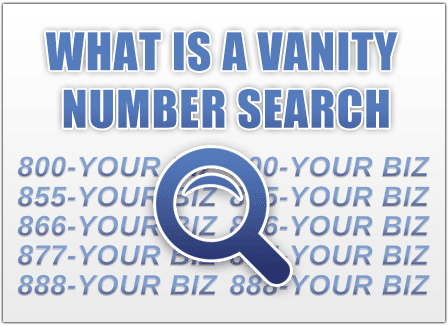 You can use our free vanity search tool to find toll free numbers that spell a word related to your business or industry in the following area codes: 800, 888, 877, 866, 855, 844 or 833. But if you have trouble coming up with vanity number ideas or if you just have a hard time finding a good number, our team is happy to help at no cost. Just give us a call or chat and tell us about your business and we’ll spend some time brainstorming and searching. Then we’ll send you a list of the best available numbers we find – with no obligation to purchase. 1. Brainstorm words and phrases related to your brand before an 800 numbers search. The first thing you should do before searching for 800 numbers is make a list of words and phrases related to your brand and business name. If your example if your company is FedEx you might try to search for 1-800-GOFEDEX. Remember your number doesn’t have to be 10 digits. The vanity number version can be longer like 1-800-CALLFEDEX. In this case, the X is an over dial, which is perfectly fine and acceptable for business vanity numbers. 2. Brainstorm words and phrases related to your industry before a toll free numbers search. You cannot always get a toll free number with your brand name in it. When that happens, try words related to your business’s industry. For example, if your company is FedEX, you might try and find 1-800-SHIPPING. Another example would be if your company is in the roofing businesses you might try to find a toll free number like 1-800-ROOFING. 3. Brainstorm words and phrases related to your value proposition before a vanity numbers search. If you can’t find vanity phone numbers with your brand name in it or a good industry term, think about your business’s value proposition. For example, if your company is FedEX, you might try and find 1-800-EZ2SHIP (meaning easy-to-ship) or 1-800-SHIPFAST or if you’re a roofing company you might try and find 1-833-NEWROOF. Using call to action words and/or descriptive adjectives like GET, BUY, FIND, NOW, NEW, CHEAP, EASY etc. can also be helpful. 4. Don’t just search for vanity 800 numbers try other toll free prefixes. True “800” numbers are the hardest to find because they are the oldest of the available toll free number prefixes. You may have more luck finding a vanity number with the prefix 855, 844, and 833 because those prefixes are newer and therefore there’s more options available. When you use UniTel Voice’s toll free number search tool, if the 800 version you’re looking for isn’t available our tool generates some closely related vanity numbers that are available if there’s any. 5. Find more than one vanity toll free number for your business. You may also consider getting more than one vanity number for two reasons. First, having more than one vanity number allows you to A/B test which phone number performs better. Second, if you have more than one toll free number for your business you can assign a specific number to each of your marketing channels (web ads, billboards, print ads etc.). That way you can track the call traffic for each channel and see which one is getting the most calls and thus has the highest ROI (return on investment).